The National Tribune was the premier Union veterans' newspaper of the post-Civil War era. Launched in 1877 by a New York veteran to help his comrades and sway Congress to pass better pension laws, a short time later the National Tribune began publishing firsthand accounts penned by the veterans themselves, and did so for decades thereafter. This rich, overlooked, and underused source of primary material offers a gold mine of eyewitness accounts of battles, strategy, tactics, camp life, and much more. From generals to privates, the paper printed articles and long serials on everything from major battles such as Gettysburg and Antietam, to arguments about which battery fired the shot that killed General Leonidas Polk, whether Grant's army was surprised at Shiloh, and just about every topic in between. Unbeknownst to many, a number of Confederate accounts were also published in the paper. 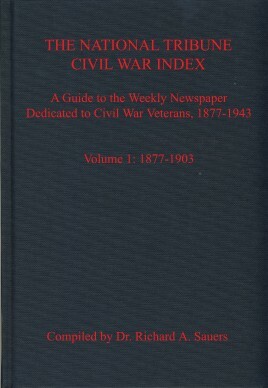 Decades in the making, Dr. Rick Sauers' unique multi-volume reference work The National Tribune Civil War Index: A Guide to the Weekly Newspaper Dedicated to Civil War Veterans, 1877-1943 lists every article (1877-1943). The first two volumes are organized by author, his unit, title, and page/column location. The third volume—the main index—includes a subject, author, and unit guide, as well as a "Unit as Sources” index that lists articles that mention specific commands but are written by soldiers who were not members of that unit. As an added bonus, this reference guide includes the contents of both the National Tribune Scrapbook and the National Tribune Repository, two short-lived publications that included articles by veterans, and a listing of the major libraries that have National Tribune holdings. Thanks to Dr. Sauers, Civil War researchers and writers worldwide now have easy access to the valuable contents of this primary source material.